Not long ago I wrote that Yahoo effectively shut down its Weather API by forcing OAuth 1.0. After what seems like an uproar by many developers Yahoo reversed it's decision (in a way) and re-enabled public access to the Weather API, but there is a catch. You have to use the new YQL way of fetching data and it seems very slow to respond. I've put together an example of this new API, read about it here: Example Yahoo Weather YQL to fetch forecasts and render with JQuery. It looks like the examples have been updated and from what I could gather it is possible to make a request to a YQL URL and fetch the data without authentication. All you have to do is URL Encode the YQL statement and pass it in using the 'q' URL paramether. 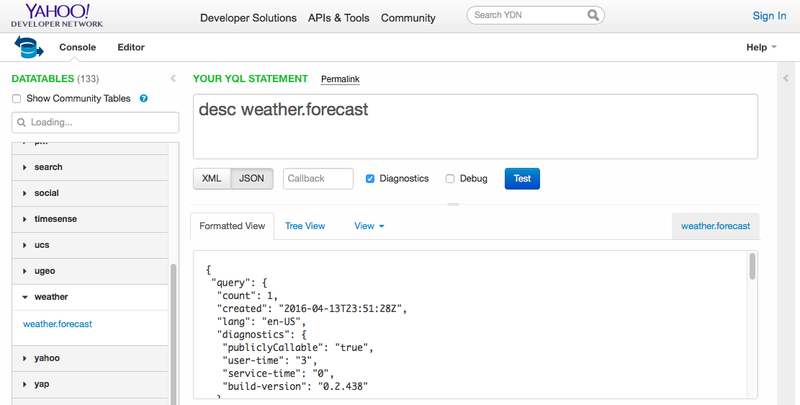 The 'format' URL parameter specifies whether the weather data should be returned as JSON or XML. In case you are wondering, I looked up the WOEID here. I'm glad Yahoo has reenabled public access but it is definitely too late in my opinion as I would imagine many like myself have switched from this API to something like OpenWeatherMap.